The organisation said older people are at risk of becoming socially isolated if their passes are taken away. AN ASSOCIATION REPRESENTING the rights of older people has urged the government to protect free travel in the upcoming budget. Active Retirement Ireland (ARI) will hold an event at the Smock Alley Theatre in Dublin on Monday to highlight the need for the scheme which the body says is an “essential lifeline” for vulnerable older people. 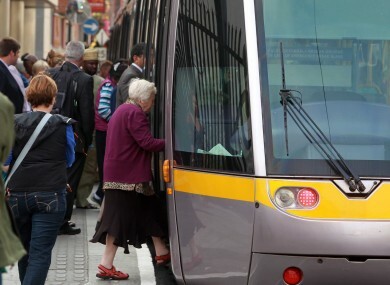 Currently everyone aged 66 and over living permanently in Ireland is entitled to the free travel scheme which is available on all public bus, rail and Dublin’s Luas services. However this scheme could be in jeopardy in the upcoming budget and ARI said it is an issue of serious concern for its members. Speaking to TheJournal.ie, Chief Executive of ARI, Maureen Kavanagh said the scheme is an important “social support” and was initially put in place to ensure a better quality of life for older people. Kavanagh said that older people, particularly in rural areas, rely on their free travel pass to go about their everyday lives and it can help them to avoid becoming socially isolated. “They use it to get to the bank and the Post Office to collect their pensions but they also use it to go to the hairdressers or to a cafe for a cup of tea which means they’re contributing to the local economy,” she said. Many older people use the pass to travel to hospital appointments and Kavanagh said that if it were taken away it could have “devastating” effects for the organisation’s members. These benefits are the things that enable them to stay well and stay active and there’s a huge danger that this whole cohort of society are going to be hit in different ways. This is the generation that worked in the country all their lives, paid the highest taxes and many of them feel like they’re barely living above the poverty line on the contributory pension. The Department of Social Protection said the cost of the free travel scheme has risen substantially over the last ten years from €45.8 million for almost 608,000 customers in 2001 to over €75 million for approximately 726,000 customers in 2011. The funding for the scheme has been frozen at 2010 levels of expenditure of €77 million as set by the previous government in the National Recovery Plan 2011 – 2014. The Department said it “appreciates the important role that free travel plays in promoting social inclusion and preventing the isolation of elderly and disabled people”. A choir made up of members of Multyfarnham Active Retirement Association in Co Westmeath will perform at ARI’s event on Monday which starts at 12.30pm. The organisation will also present research findings on the impact of membership of the organisation on the lives of older people. Email “Active Retirement Ireland urges government to protect free travel in budget”. Feedback on “Active Retirement Ireland urges government to protect free travel in budget”.